Garlic sauce aka is garlic paste is a common dip served with many arabian or Lebanese chicken dishes. Its also served with chicken Shawarma, grilled chicken, shish tawooks, barbq etc. 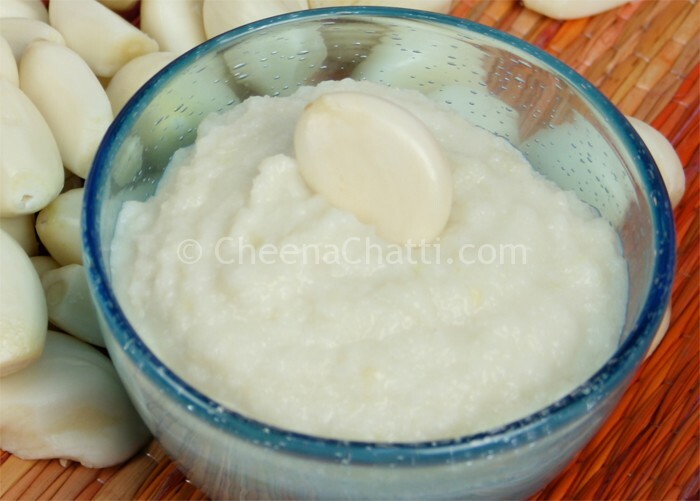 Try this quick and easy to follow recipe of arabian garlic sauce. Take out the cloves of garlic and peel off their skin. Extract the juice from the lemon. In a mixer/food processor add the garlic and salt – run it for 10-20 seconds. After 10 – 20 seconds, stop the mixer and wipe together the garlic paste from the sides of the jar and run it for another 10-20 seconds. Repeat this process 3-4 times until the garlic gets crushed and starts to turns pasty. This is very important. Add the oils ( preferably canola/ sunflower/ peanut), slowly as a thin stream to the mixer along the sides. – around ½ cup at a time. You can notice that the garlic paste starts emulsifying. Add ½tsp of lemon juice into the mixer as thin stream, just like the oil. Wait for a few seconds and then repeat steps 8 and 9 until the ingredients are completely used up. Serve the garlic sauce with Al faham chicken / Grilled chicken or BBQ. Do not exceed the oil and lemon juice quantities in each addition. If the sauce splits or if at any point the paste is turning liquid, there is no option to save it back. Just stop it there because it’s ruined. This may get a harsh or strong flavor if you use heavy oils like olive or if the garlics are stronger in flavor. If the garlic’s are strong ones, reduce their numbers. If its hot with light oil too, it means that it needs more oil. You can also try more arabian recipes from our collection. This entry was added on September 26th, 2013 by Reeja MytheenKunju in Condiments and tagged with lebanese garlic sauce, garlic dip, shawarma garlic sauce, garlic paste, garlic sauce. Last revised on April 4th, 2018.